July 2015 - Bernardo Cortese M.D. 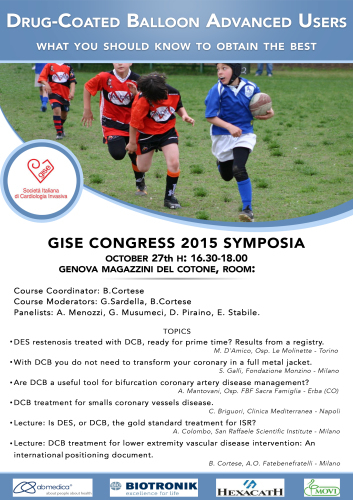 During next meeting of GISE, the Italian Scientific Society of Interventional Cardiology, for the first time there will be a Symposium totally dedicated to drug-coated balloons. Thanks to the efforts of the following companies: AB Medica, Biotronik, Hexacath and Movi, some of the most renown experts on the field will give a contemporary glimpse to this extraordinary technology.